One of my fondest memories as a child is something that went down in local history as The Great Pine Cone War. In retrospect it probably wasn't as grandiose as to deserve that title, as it was basically just a bunch of stupid kids chucking pine cones at each other, but to us at the time it was something more. It was war, and it was fun. I still remember the basins of every house filled to the brim with stockpiles of spiky grenades, the reckless abandon we displayed as we tried to make an already painful experience hit just a little bit harder, and the gobsmacked look on the faces of our parents when they finally came outside to see what the hell we'd been doing all day. 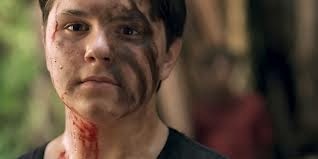 The new indie comedy I Declare War captures the essence of this gloriously violent tradition of mock warfare perfectly, exploring a complex facet of adolescence in a way that is all at once endearing, disturbing, and instantly relatable. 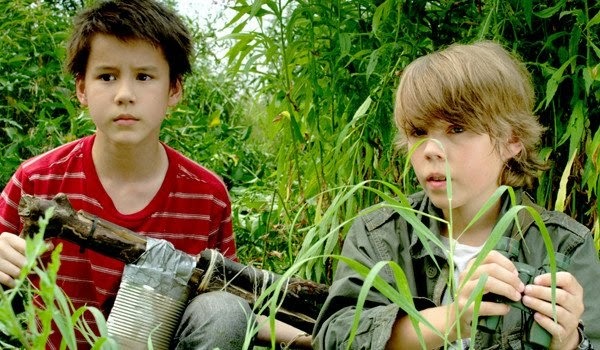 The film follows a group of young children playing an elaborate game of play combat that quickly spirals out of control as participants on both sides begin to take things just a bit too seriously, with friendships and innocence at risk of becoming casualties of war. The rules are fairly simple but more than we ever bothered with as kids: If you're shot with a pretend gun, you're stunned until the count of ten, and if you're hit with a red paint filled balloon grenade, you're dead. The winner is whoever captures the other team's flag, or wipes out the opposition completely, whichever comes first. The set up is delightfully familiar at least to any man (not sure how many girls grew up craving bloodshed on the battlefield, though I wouldn't presume to guess either way). At least it is until the actual guns start popping up. Of course, they're not actual guns, but we the viewers see them that way. Its one of the little fun twists that make this movie work so well. We see the events play out from the skewed perspective of the juvenile soldiers involved, reacting to their reality where sticks tied together and fired with "phew phew" noises are transformed into realistic weapons of war. The closest comparison would be to one of the greatest children shows of the 1990's, The Adventures Of Pete And Pete, where the most mundane events were lent the most intense dramatic weight through the eyes of kids, for whom everything is the end of the world. The juxtaposition of young children holding real guns is no doubt meant to shock, and perhaps it still does for some, but more importantly, it sells the idea of how seriously these kids are taking this game as it plays out, becoming less fun and more harrowing as the day wears on. As a satire on the genre tropes of war movies, I Declare War is spot on, its main theme presenting itself as an almost Kubrickian cynicism concerning the similarities between real war and the immature games of children. Our hero, to the extent that anyone is a hero in this movie, is obsessed with the film Patton and the Art Of War by Sun Tsu, and his chief adversary is the kind of loose cannon driven to madness by his need for revenge that Telly Savalas might have played in another version of this story. When stock characters like the lone wolf, who wields no weapons because he himself is a weapon, are re-imagined as children, the impulse is to laugh or at least feel uncomfortable for wanting to, but the best part about the movie is that it never tries to be in on the joke. All the actors play it straight and the tone is as serious and hard bitten as possible under the circumstances, which I can only imagine is a much harder thing to do with a cast this young. 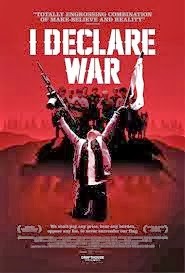 I Declare War works on pretty much every level, and it so easily could have failed spectacularly given the delicate nature of what it sets out to accomplish. While it is in no way inappropriate in terms of what it demands of such young actors, it still manages to go to some very dark places and doesn't pull any punches along the way. If they didn't use it already, a good tag line for the poster might have been "It's All Fun And Games Until Someone Gets Hurt," and though the pain in question is largely emotional, it is surprisingly heartfelt and effective even allowing for the silly premise. It doesn't let the satire interfere with the personal story or make the characters feel any less real, managing to tell a story independent of what one might otherwise call a gimmick. Its the kind of movie I might have thought undoable given the risk of screwing it up, but these guys make it look easy.